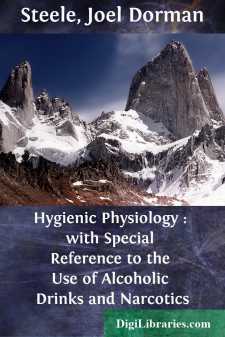 The term Physiology, or the science of the functions of the body, has come to include Anatomy, or the science of its structure, and Hygiene, or the laws of health; the one being essential to the proper understanding of physiology, and the other being its practical application to life. The three are intimately blended, and in treating of the different subjects the author has drawn no line of distinction where nature has made none. This work is not prepared for the use of medical students, but for the instruction of youth in the principles which underlie the preservation of health and the formation of correct physical habits. All else is made subservient to this practical knowledge. A simple scientific dress is used which, while conducing to clearness, also gratifies that general desire of children to know something of the nomenclature of any study they pursue. To the description of each organ is appended an account of its most common diseases, accidents, etc., and, when practicable, their mode of treatment. A pupil may thus learn, for example, the cause and cure of "a cold," the management of a wound, or the nature of an inflammation. The Practical Questions, which have been a prominent feature in other books of the series, will be found, it is hoped, equally useful in this work. Directions for preparing simple microscopic objects, and illustrations of the different organs, are given under each subject. The Readings, which represent the ideas but not always the exact phraseology of the author quoted, have, in general, been selected with direct reference to Practical Hygiene, a subject which now largely occupies the public mind. The dangers that lurk in foul air and contaminated water, in bad drainage, leaky gas pipes, and defective plumbing, in reckless appetites, and in careless dissemination of contagious diseases, are here portrayed in such a manner as, it is trusted, will assist the pupil to avoid these treacherous quicksands, and to provide for himself a solid path of health. Under the heading of Health and Disease will be found Hints about the sick room, Directions for the use of Disinfectants, Suggestions as to what to do "Till the Doctor comes," and a list of antidotes for Poisons. Questions for Class Use, a full Glossary, and an ample Index complete the book. Believing in a Divine Architect of the human form, the author can not refrain from occasionally pointing out His inimitable workmanship, and impressing the lesson of a Great Final Cause.